As my musical tastes have evolved over the years, one group has pervaded throughout: Rush. My interest to them grew in parallel with my drumming, at least in my formative drumming years, and that attachment has persisted. That said, as much as I love Rush, it has been a long time (Roll the Bones tour in 1991) since my last Rush show. In fact, I didn’t really anticipate seeing them ever again, mainly because I tend to see live music at smaller, more intimate venues, but also because I just haven’t connected with anything they have done in the past 20 years (since Counterparts). But this tour felt different to me. This one, I needed to go to. 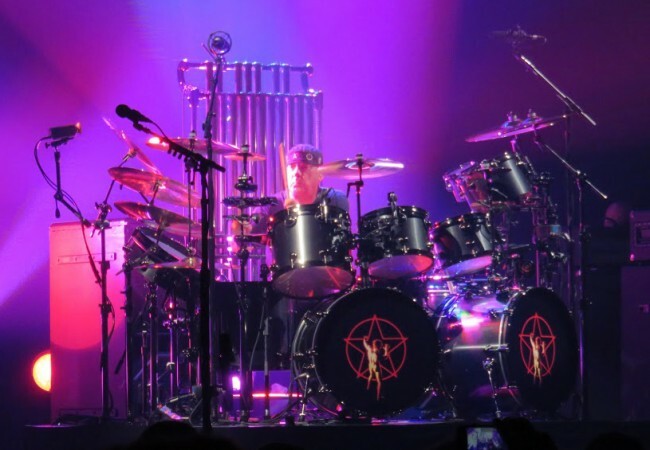 The Rush 40th Anniversary Tour is likely their last and one that celebrates an incredible run by this quietly influential band. 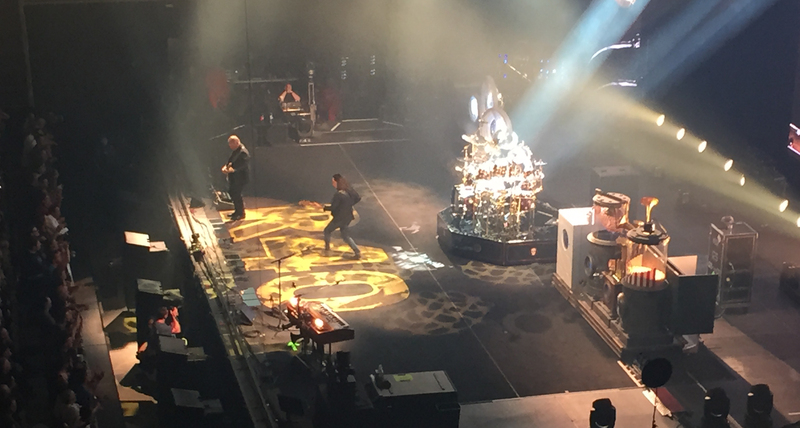 Moreover, their concert was going to cycle backwards through their copious collection of songs (roughly 170 in total, depending on how you count some of them), touching on Rush-nerd classics such as Natural Science and Jacob’s Ladder. Again, this felt like a must attend event. First of all, I do want to highlight the fact that the show had no opening band and lasted over three hours from start to finish. Not bad for a trio of 60+ year olds, huh? The show was scheduled to start at 7:30pm. It actually kicked off at 7:45pm. There was a fever pitch in the arena starting at about 7:20pm, lasting all the way until the opening video started off the show. Any time the lights dimmed a little during the time leading up to the start of the show, the crowd noise would swell with anticipation, only to settle back down until the next false alarm. Once they started, the first set lasted a little more than an hour, during which they played 10 songs, spanning the albums Clockwork Angels through Signals. The band then took a “short break to rejuvinate” lasting about 20 minutes or so, after which they played another 16 songs (keep in mind that some of these songs lasted 10 or more minutes). The show closed at 10:50pm. 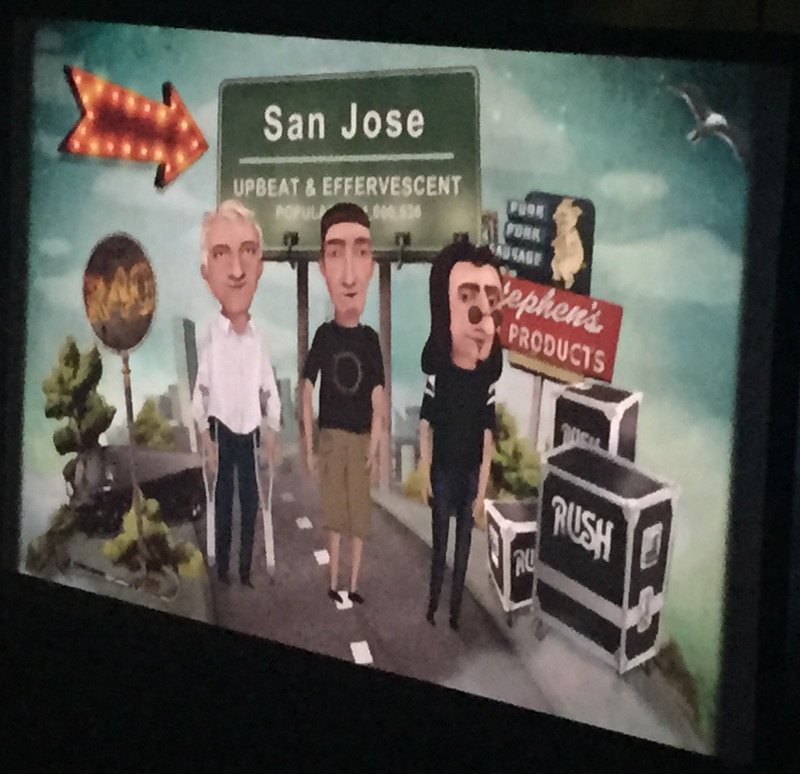 Unlike previous Rush concerts that I have been to, this stage design was super clean and simple. There we no big hats with rabbits in them, for example, bouncing around the stage at various points in time. Most of the stage floor was open and flat, with just a big yellow R40 in the middle near the front. There were some simple stage affects (e.g. popcorn machine, laundry machines, fake Marshall stacks, etc.) to either side of the drum set that we bordering on goofy, but I found them largely unoffensive. It was also a bit entertaining to see the guys in orange R40 suits walking across the stage in the open to shift around those affects during the song. I also appreciated the apparent obliviousness of the band members to these moments which were clearly designed to be there. Behind the drum kit was a large screen flanked by two tall and narrow screens. These screens were used to present a range of videos between and during songs. More on this later, but I think it was classy, out of the way of the actual performance, and generally enhancing to the show. This was the show of two sets. In the first set, I will sum it up by saying that I felt like Geddy was thrilled to be there, Neil was thrilled to just be playing the drums, and Alex was just thrilled to be alive. 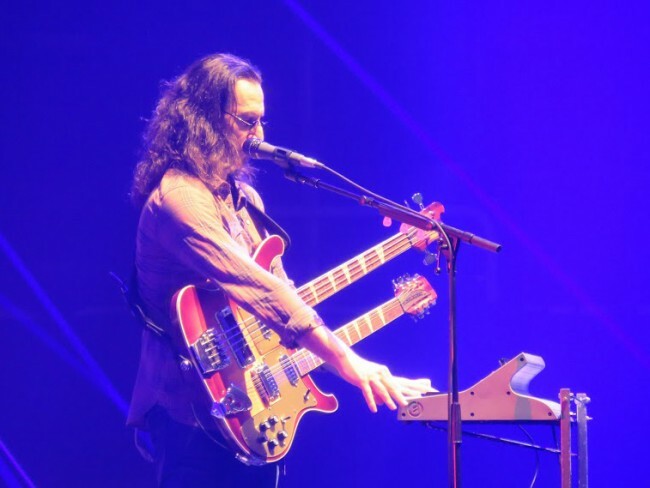 To be more specific, Geddy was bouncing around the stage, deftly managing his significant workload while occasionally doing his awkward duck walk. His enthusiasm definitely could not have been mistaken. Meanwhile, Neil was behind the kit with a typical stoic expression. While he played pretty proficiently throughout the night, he just seemed hunched over the whole time like this tour was weighing him down. I got the sense that he would be more happy just playing the drums back in their garage in Toronto. Alex, well, he was very stationary for the first set and there was little evidence that he was even awake. It really did feel like a two person band for most of the first set. This is particularly surprising given that Alex is the youngest of the three – he should have the most energy. Between sets, however, they took a 20-minute break. I have no idea what they did back stage, but Alex was a different player afterwards. 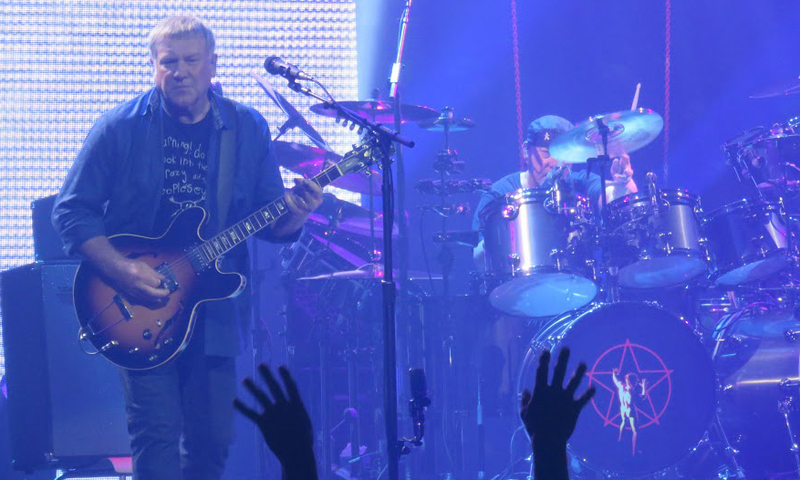 Maybe he got an injection or perhaps he was uninspired by the more recent material (similar to the sentiment of the majority of the crowd, I presume)… Whatever it was, the second set put the “life” back into Lifeson. No change in energy or performance for the other guys, for the most part. Neil definitely showed his age. Don’t get me wrong, he is still a great rock drummer and he generally played well, showing the poise of someone who has nearly 50 years experience on his instrument. I have two major critiques of him in this show though. First, and more fundamentally, he continues to play most of the parts as he crafted them on the albums. Granted, the parts are well-constructed. But he has the ability and creativity to improvise or vary things up more. It would be great to see the fills in Tom Sawyer and YYZ, for example, played differently than their first incarnation nearly 35 years ago. The second issue is that he simply made a bunch of mistakes during the show. I don’t mean mistakes like he played the wrong part. I mean, he would occasionally stumble and miss the one. The most obvious occasion of such a misstep was in the triplet-based fill leading into the guitar solo of Tom Sawyer – he must have played this a million times correctly in the past, yet this was a big flub. Geddy and Alex played on and Neil caught up again, so no real harm. I note this because it is really uncharacteristic of an otherwise very precise player repeating the parts he has always played. To be clear, this didn’t really adversely affect my enjoyment of the show. I just noted it as an oddity, one that is likely a result of an aging player who has been touring on and off for 40+ years. Neil played a mini-solo in the first set. He played a larger one in the second set which split the uprights between the beginning and the end of Cygnus X-1 (with the middle of the song getting excised completely). I don’t have much to say about the solos aside from the fact that he played them well and that I am a little disappointed that the majority of both solos consist of parts that I have heard many times before. There were definitely nuggets in both that were exceptional though. I loved Neil’s drum kit choices! He ditched the circular drum set with all of the extraneous pieces in favor of his older and more traditional configurations. Of course, the different eras have different percussive needs, so in exchange for the circulating kit Neil had his crew swap out kits during breaks so he can have the appropriate apparatus based on where the set was in the 40-year history. For example, the kit he played after the big break included the chimes and bells for Xanadu and Closer to the Heart. 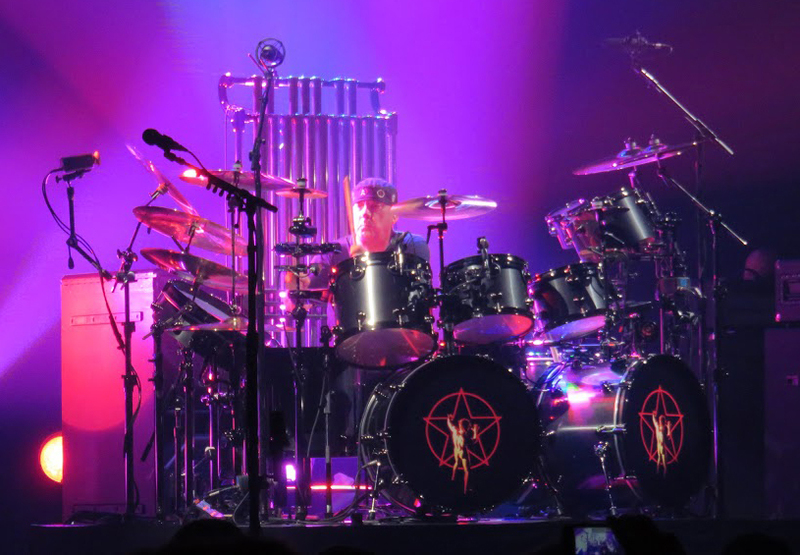 It was refreshing to see him get back to some of the roots and to match the simplicity of the stage design with the simplicity in his drum sets (with “simplicity in his drum sets” being a relative phrase). The other really noteworthy detail about the instruments is that both Geddy and Alex pulled out their double-neck guitars for Xanadu. Those things look great! First, coming up with a set list for these shows must have been a very difficult task to take roughly 170 songs or so and boiling them down to a set list that would cover about two hours and forty five minutes worth of material. There are the obvious songs that you would expect, like Spirit of Radio, Closer to the Heart, Tom Sawyer, and Subdivisions. But I was thrilled that they pulled out some others that cater to the more committed fan, like 2112 and part of Hemispheres. Songs that surprised me that they didn’t play include Limelight, Show Don’t Tell, and The Trees, I would have gladly forsaken any of these in favor of La Villa Strangiato, Vital Signs, and By-Tor. All in all, a reasonable set list given the concept they were shooting for. That said, if I were them, I probably would have trimmed the bookends and had the entire set be material from between Fly By Night and Roll the Bones, giving them more time to fill out the set with their stronger material. Again, just my opinion. There were a bunch of videos that they played throughout the show. Overall, I found them to be a lot of fun and a good break from the music. It was great to see the cameos from a range of comedians like Paul Rudd, Jason Segal, Eugene Levy and Jerry Stiller. I like how they didn’t take themselves too serious during the interludes – they were able to laugh at themselves a bit. Good stuff. The videos during the music were also interesting at times, but I found myself not paying attention to them during the actual performance. Maybe this is because I was sitting off to the side more. All in all, this was a great show. With the ticket prices what they were, I feel like I did my part in sending this under-appreciated band out to pasture… but I don’t feel bad about spending that money at all. The material is as great as ever and they played it well and with dignity. Thanks for all the memories, Rush!